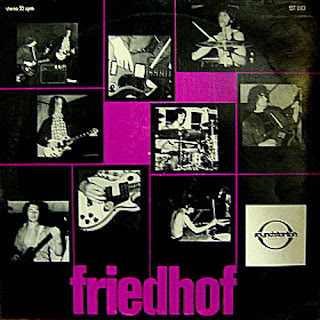 'Friedhof' were an early-1970's underground band who produced just the one obscure album, and then disappeared into obscurity. The self-titled record, which sounds like it's recorded in a sewer, is largely a collection of totally freaked-out guitar, bass and drums instrumentals, charged to the power of brain-numbing intensity. So, whilst a touch grungy and raw in the production department, the sheer quality of the music overrides the technical defects. This is one for those who not only like their rock music with guitars afire, but - white hot!